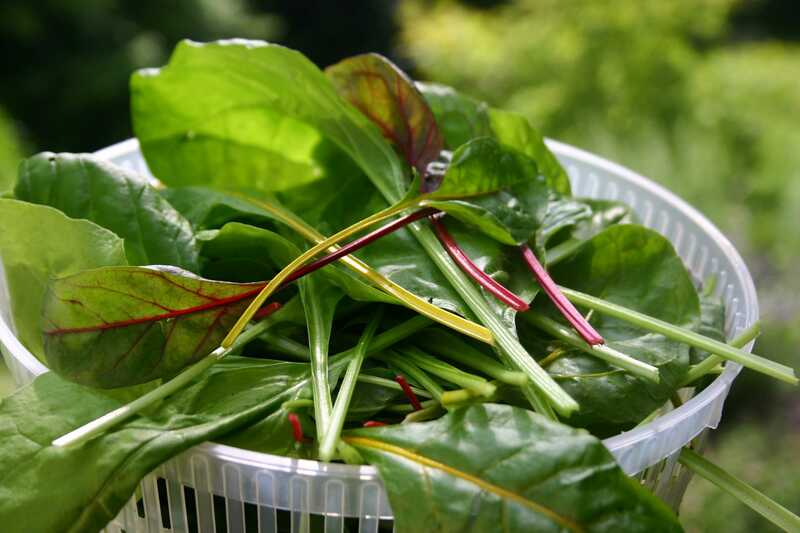 Separate the chard leaves from the stems and cut the stems into 2-3cm pieces. Chop the leaves. Then, in as little water as possible precook the potatoes in bite-sized chunks. Add the chard stems about 5 minutes before the end of cooking time, keeping the lid on the pan. Do NOT drain the potatoes! Mix all your spices together. Heat the oil and sauté the onion until soft, then add the garlic and cook for one minute. Now add the spices and tomato puree and stir for another minute. 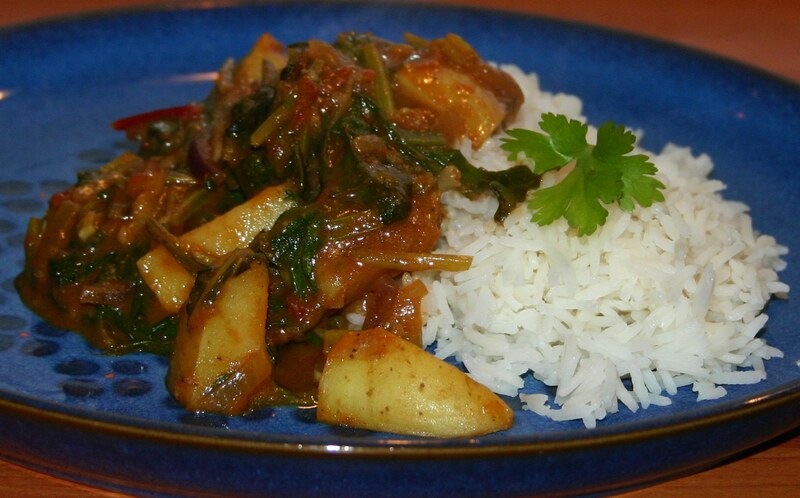 Add the tomatoes, then tip in the potatoes and chard stalks WITH the water. The starch helps thicken up the sauce. Add sugar, salt and pepper, chard leaves and coconut milk. Stir and let bubble until all the greens have wilted and the sauce has thickened. Another recipe for greens coming up tomorrow! This entry was posted in Food, Garden, Herbs & Spices, Recipes, Vegetarianism and tagged Food, Garden, Postaday, Recipes, Summer, Vegan, Vegetarian. Bookmark the permalink. It is delicious! We’ve had a lot of heat and a lot of heavy rain, so my chard was looking stressed – I decided to cut it all right back for a fresh start! What a terrific use for unruly chard. The spinach bolted and the chard has all been used up, so hope it starts sprouting again soon! Hi Elaine. Hope you get the chance to try it out! I love chard, red, green and yellow indifferently, I grow them too. Your recipe sounds delicious, if you like to try mine is really simple. Saute’ garlic in olive oil, add chard with a bit of dripping water. Season with salt and black pepper or chili pepper for a kick. Close the lid to create a steam and cook until chard are soft or to your taste. Add a cup of water if needed. When done mix with beans, or steamed rice. That sounds delicoius… anything with garlic and greens is good. Thanks for stopping by Valentina! That sounds goooood! 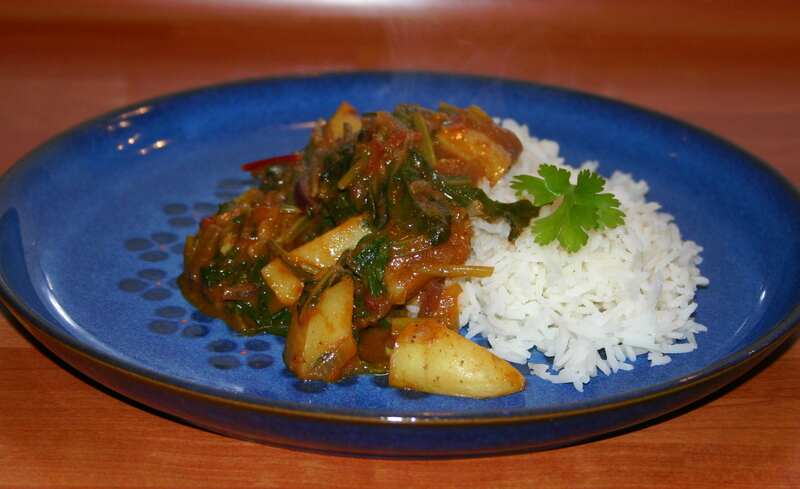 I´m not a big fan of Indian food, as there´s one spice in it I don´t like at all, but I´ve never been able to find out which one it is. With this recipe I can use whatever I want!